Hi, I’m Amanda and I’ve had the same hair since my sophomore year in college. To put a date on it, I guess that would make it almost 7 years (is that terrible?). I’ve never been much for change, and have always been somewhat of a ‘plain jane’ when it comes to hair, but hey-it works for me. After writing a few posts on here about my hair and the fact that I don’t use shampoo, I’ve had (strangely enough) multiple people ask me how I style it. Here’s the thing. I hate spending time on my hair. I make it a point to take less than 20 minutes on my locks each and every day. To me, styling my hair and putting on tons of makeup is just a waste of time. I have plenty of other important things to do then spend hours getting ready in the bathroom. I’m sure I get bonus points from my husband for keeping the bathroom so free in the mornings. #2-the precious skill of using a diffuser (seriously the most amazing styling tool I have ever used). 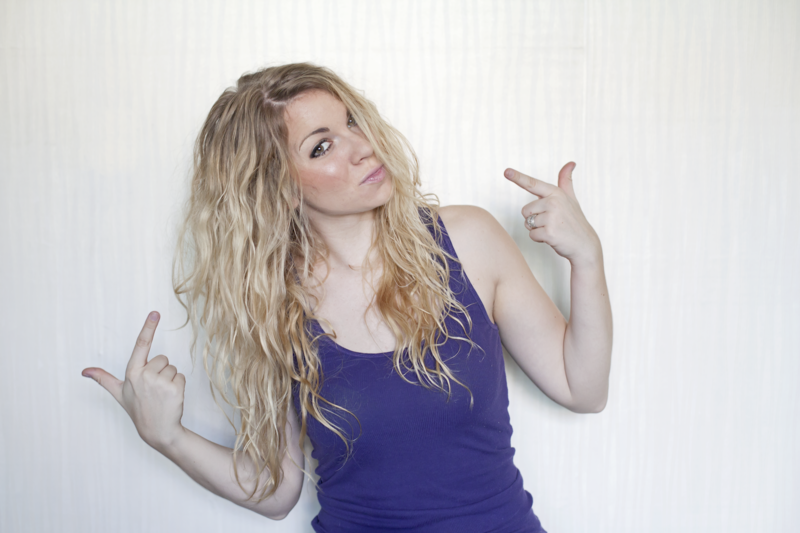 Now, if you don’t have naturally wavy hair, don’t be disappointed. You can still achieve this look! 1. After taking a shower, detangle your hair with your fingers. Don’t use a brush because it’ll pull out any curl. Scrunch wet hair with a towel. 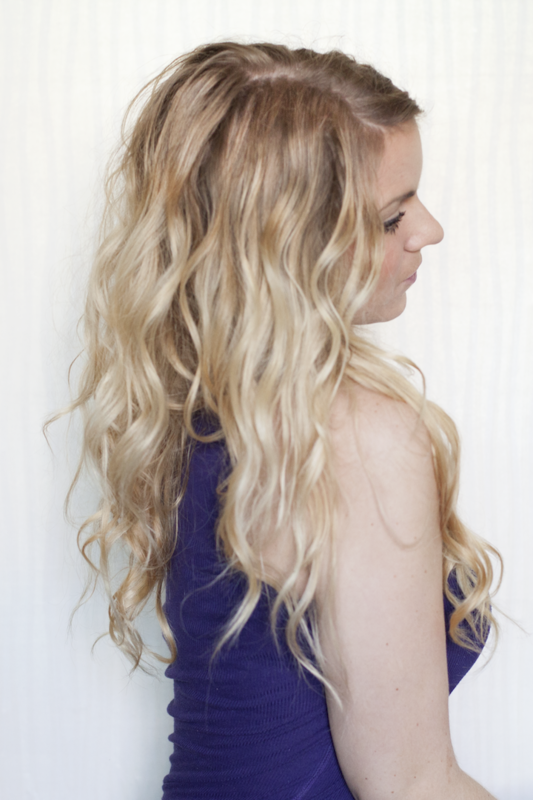 After scrunching your hair with a towel, add in mousse by scrunching it in with your hand (yes lot’s of scrunching). Now your hair is ready to be diffused. Put the temperature on hot and blow dry away! 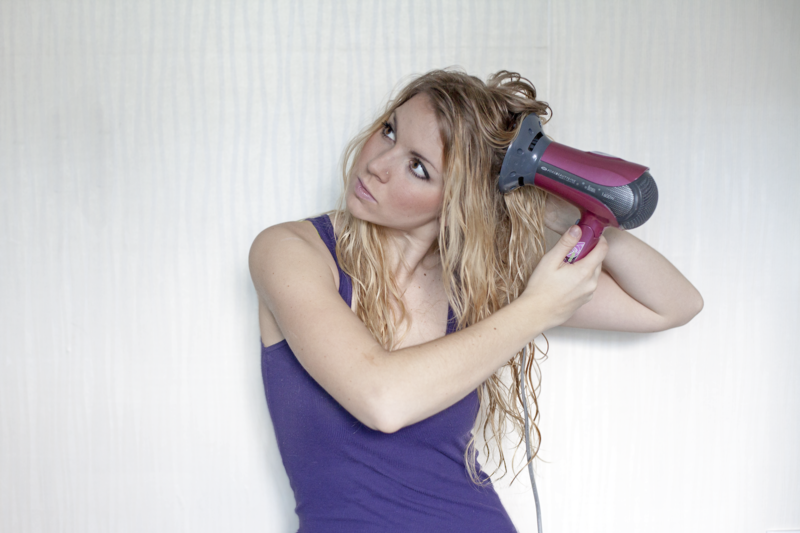 Be sure to (yet again) scrunch the hair with your blowdryer, holding it in one place for a good 5-8 seconds. If I’m in a huge rush I’ll just leave it this way. It only takes me about 8 minutes from the time I step out of the shower. By the way, while I’m blowdrying my hair, I turn my curling iron on so that it’ll be hot by the time I’m finished drying. 2. 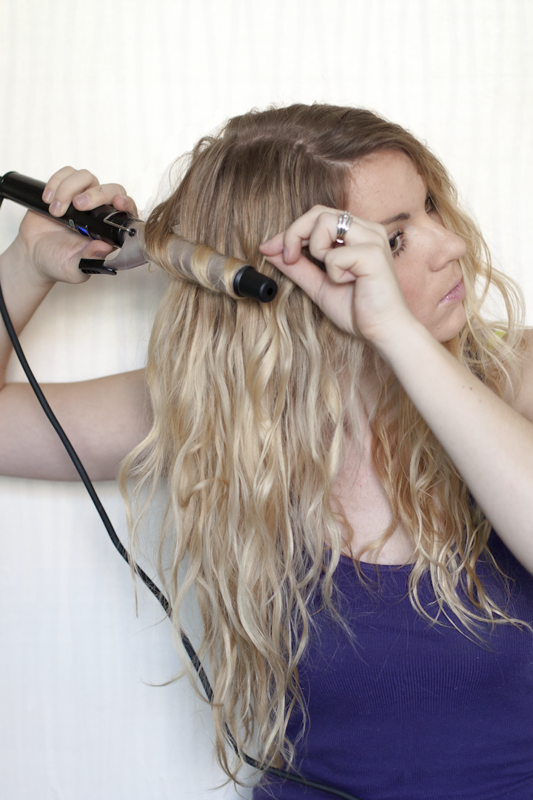 Immediately start using your iron, wrapping your hair around the outside of the iron instead of through it. There is no real order as to what pieces curl, I just pick the ones that didn’t curl very well with the diffuser. Curl away until you’re happy! 3. Once I’m finished curling I’ll run my fingers through my hair again to separate and loosen the curls a bit more. Then I’ll add a little bit of hairspray for body and call it good! It’s seriously as easy as that! Now you know my secret to success. But guess what? It gets better. With this style, the next day you’ll most likely be able to brush and go, no extra curling required! How’s that for low maintenance? What kind of mousse do you use? And also what kind of hairspray? It looks like is has a flexible hold. Do you spray the hairspray just on your roots, or also on the length of your hair? Thanks! My hair is similar to yours and I’m transitioning to Water only washing. I was wondering what you use to lighten your hair? Do you do it in a salon or something more natural? Thanks! Love your blog! Sorry, I know this is an OLD post… but your hair is amazing and is very similar to mine! I see you use the “no poo” method, which I do not (yet) but I am thinking that is helping w/ you having no frizz (amazing!) Anyway, I have to ask what kind of mousse you use and do you use any sort of antifrizz serum or oil? 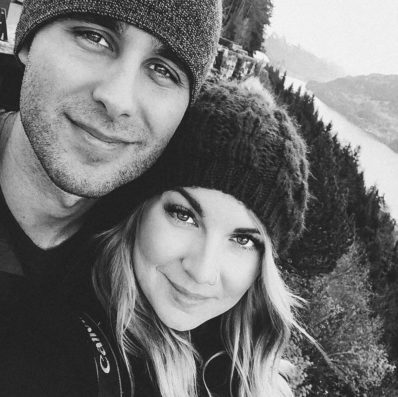 I am guessing not, since you didn’t mention it, but I gotta know :) Also, you say a 1.5″ curling iron works best, but is that a 1″ you are using in the photos? I only ask because I love the outcome and I have both… I actually may use both! Thanks so much! My hair is exactly like yours naturally. It’s got wave but not the wave we all want. I have curly hair naturally and this may seem like a strange tip, but it was recommended to me a few years ago and I do notice a difference. When you are scrunching your hair it helps if you don’t use a thick towel. Even try with a sheet of paper towel (or a really thin cloth) when you are scrunching and taking some of that extra moisture out. Not sure if it will make a difference for wavy hair, but it definitely helps scrunching with my curly hair I’ve found. I don’t use a towel to dry my hair either.. just a cotton tshirt. Works like a charm and I have less frizz. I have naturally curly/wavy hair and usually just ‘comb and go’ and then let the elements outside do the rest! My hair just springs into waves and curls of its own accord, so I gave up styling in years ago. I am also getting lazy in my old age (my birthday is this month and I am feeling it) but I do like the idea of a diffuser. My hair is incredibly thick and I do not own a hair drier as it will take me over an hour to actually get it all dry – so does a diffuser speed up the drying process? Thanks in advance for any help! I love this look! I wish I had SOME wave in my hair to get this but my hair is so so so straight! I have a diffuser and never used it, I should really give it a go. I’m the type that changes hairstyles a lot, I’ve had it long, short, a-symmetrical, red, blue and anything in between. I guess I like change haha. Diffusers are awesome! I need to get a new one! (Left it on vacation forever ago.) I also should probably actually learn to use a curling iron. haha. Your hair looks great! Thank you Stacia! I couldn’t live without my diffuser! I have super short hair, but I love that curly styles are becoming popular again! I have wavy hair so if I ever choose to grow it out I’ll refer to this! However I do love your hair, it’s so pretty even short! :) Talk about low maintenance! I am curious to see you hair longer though! Never!! If I remember right, you did have pretty long hair back in the day! ;) Probably not this long….but…pretty close! Love you dad! Diffusers are God’s gift to wavy haired people. SRSLY. I’m envious of you spending less than 20 minutes, because…yea. You know how it is when you have a whole mess of hair! Normally, I just ponytail it since I’m going to be at the gym anyhow, but when I DO style is…oh lord. :) You have gorgeous hair lady! Yes the gym is the bane of hairstyles everywhere. I love love love my diffuser! I brought mine from the States when we came to Korea, and of course it didn’t work. Guess what was the FIRST thing to buy at the store? I’m skeptical that that would work for my hair but I feel like I should give it a try this weekend. It’s just so easy and if it did end up working, I’d be ecstatic. Thanks for the tips. Now I’ll have to hope that my diffuser is around somewhere…!